Part of the lifestyle of living sustainably can also mean making your own natural products such as soaps, bug deterrents, cleaning products, and other skin care necessities. Once I have the ability to make my own lye with ashes from our wood stove this winter, I want to get into making my own soaps, both for our bodies and our laundry. Someday when I have bees, I want to harvest their wax for lip balms and such. Sunscreen is one thing that I find particularly interesting. I’m fair-skinned, and have despised sunscreen with a passion for my entire life. I have always hated the fact that my choices were either: burn, cover up completely in 70-100+ degree weather, or put on greasy disgusting sunscreen. The moment I put on sunscreen all I want to do is take a shower to get it off. Most of the time I would choose burn, to be honest. As I’ve gotten older I’ve accepted my pale skin more and more, covering up more in the heat, and trying not to complain about it. Then, I went on a long holiday to New Zealand. New Zealand has a big ozone hole in the atmosphere right above it. Sunscreen was my unfortunate constant companion. One day we were out all day in the sun, and it was HOT. I made a point to reapply sunscreen every few hours, as much as I loathe it. At the end of the day, I was burnt to a crisp anyway. I took a hot shower that evening (it works, trust me, something about it takes the heat out of your skin… I know my way around a sunburn. Even had a bout of sun poisoning while in Florida many many years ago – and yep, I had sunscreen on then too!). The next day was more of the same, I angrily put on MORE sunscreen, and cried. I HATE the stuff. So now you know my motivation for the research I’ve put into making my own natural sunscreen. I, like all of us, have been taught my whole life that sunburns cause skin cancer. So, apply sunscreen every few hours to protect yourself, right? Not exactly. The simplest (and I do mean simplest, this topic is a lot more complicated than this) explanation is this: the sun produces two types of rays: UVB and UVA. UVA rays are the dangerous ones that can cause cancer. UVB rays are the good ones that give you vitamin D. When your skin starts to burn, it means you’ve absorbed all the vitamin D you can take for the time being, and your skin is starting to reject the sun. It’s time to get out of the sun, your skin is telling you. Guess what most commercial sunscreens protect against? UVBs. Yep, the good vitamin D rays. I could go a lot more deeply into how I feel about that… but I won’t (this blog is about homesteading, not conspiracy theories 🙂 ). 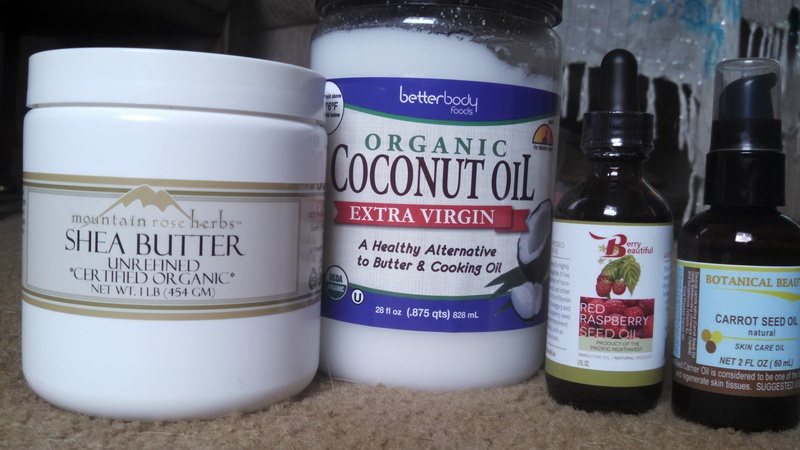 My ingredients: 1/2 cup Shea butter (SPF 4-6), 1/2 cup Coconut oil (SPF 4-10), 2 tsp Red raspberry seed oil (SPF 25-50), and 2 tsp Carrot seed oil (SPF 35-40). These numbers are all depending on who you ask and purity. I got as pure and organic as I could find. Red raspberry seed oil also protects against UVA rays (is apparently one of the only things that does!). First of all, a little of it goes a long way. You don’t need to slather it on, and if it’s at the right temperature/consistency, it spreads pretty evenly. I didn’t end up as burned as I thought I would in general, and it seems like my sunscreen just made my leg slightly less burned/more tan than the other. The other times I’ve used it, on my arms and shoulders when we’re out for short periods of time, it seems to work really well. There’s more experimenting to be done, and I have more tweaking of the recipe to do, but for now, I like it and I’ll take it! Plus, if you like the nutty earthy smell of shea butter, like I do, you’ll enjoy the fragrance a lot more than commercial sunscreens. And it makes your skin all silky smooth. All the benefits! My next experiment is bug sprays! Well hot damn we got ourselves a driveway! Can’t really do much of anything unless you have basic vehicular access to your property, so a driveway was a first logical priority. We had been recommended to a local guy, who happens to live off-grid 2 miles from us, who has a tractor and a dump truck and does driveways! So he came over the day after we arrived in town a couple of weeks ago to check out our lot. We needed not only a driveway, but also a leveled out spot to put our cabin. The next morning he came by with his tractor at about 7am, we were fresh up from camping out there, and we got to work. We helped hand saw some scrub oak down, while he started clearing with the tractor. It didn’t take more than a couple of hours to bulldoze everything down and create some nice flat dirt areas. Scrub oak is rubbery stuff that can be hard to tear out of the ground with a tractor, so we sawed the rest of the roots out of the ground while he went to get our first load of rock. He was able to get three loads of rock that afternoon, both 3″ rock and 3/4 minus gravel, to get the driveway portion almost finished. The next day he brought two more loads of gravel for our cabin location. It looked pretty good, plus we’re on a budget, so we kept it at that for a few days. After some careful consideration though, we decided one more load would be just right, so he came back a few days later with one more load of gravel. We were able to level it out and spread it so we have a good spot to put our cabin. We moved our camp up to our newly graveled flat spot, and admired our accomplishment. Of course, it rained and rained and RAINED while we were there, so we spent a lot of our time inside our tent, or giving up and going into town for awhile until the storm died down. It made us that much more anxious to get shelter up there. Poor Loki had been bitten by some sort of insect and was nursing a swollen paw the whole week, so he didn’t feel good as it was. He spent most of the day sleeping in the car or putting himself in the tent while we did various projects outside. We cut up some of the scrub oak that had been pulled up for future firewood, and limbed a few of the ponderosas of their lower dead branches, also for firewood, aesthetics, and general health of the trees. So between rainstorms we were hand-sawing wood, collecting dirt for garden beds, and enjoying a few beers. We saw a beautiful buck deer wander through the lot next to ours, a mama doe with two spotted fawns down the road from us, I caught a glimpse of a doe meandering through Amelia’s meadow, we watched stellar jays do their ninja dances in the trees, and we were warned a couple of times about the amount of black bears in the area. Remember those first 3 priorities we had? Storage, driveway, shelter? Well, we managed to accomplish the first two, and the third has been ordered. For this trip we rented a uhaul and packed it with most of our big stuff, then stuffed a 5×10 storage space in town. Now a lot of our things (even with the small amount of stuff we feel like we have, I need to downsize STILL) are in storage, including a wood stove given to us by a friend. Our next trip out there will be for the delivery of our tiny house cabin! Ok, judging by a few conversations we’ve had with people over the past couple of weeks (with people we don’t know, mind you), I apparently have to define what “homesteading” is. There are multiple definitions of homesteading, some old definitions, some legal definitions, some modern definitions. a person’s or family’s residence, which comprises the land, house, and outbuildings, and in most states is exempt from forced sale for collection of debt. (as provided by the federal Homestead Act of 1862) an area of public land in the West (usually 160 acres) granted to any US citizen willing to settle on and farm the land for at least five years. (in southern Africa) a hut or cluster of huts occupied by one family or clan, standing alone or as part of a traditional African village. 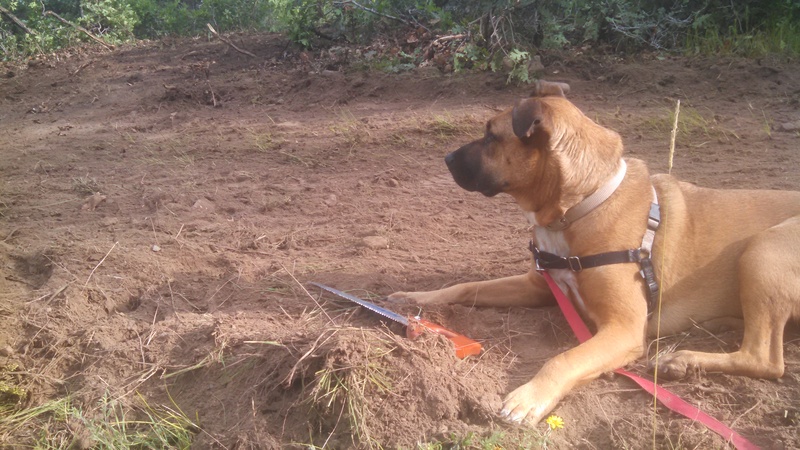 Muddy Loki will just wait patiently while we learn about homesteading. OK people. Here’s a MODERN definition of homesteading: Homesteading is a lifestyle of self-sufficiency. It is characterized by subsistence agriculture, home preservation of foodstuffs, and it may or may not also involve the small scale production of textiles, clothing, and craftwork for household use or sale. Modern homesteaders often use renewable energy options including solar electricity and wind power and some even invent DIY cars. Many also choose to plant and grow heirloom vegetables and to raise heritage livestock. Homesteading is not defined by where someone lives, such as the city or the country, but by the lifestyle choices they make. Look, I’m even talking on a CELL PHONE. So we will be practicing a modern form of homesteading. Renewable and sustainable energy sources, growing/canning/preserving/drying our own food, raising animals, living off the grid. And by living off the grid we mean we will not be attached to city water lines or power lines. We will have to haul our water and create our own power. We’ve also heard people say that “living off the grid” also can mean living like hermits away from other people and not being a part of society. Yes, we did buy our property. Yes, we will be paying taxes. Yes, we will be a functional part of society. Yes, we will have jobs. Yes, we will probably be regulars at the brew pubs in town! So now that that’s all cleared up, let’s get back to the fun stuff, eh?! Pardon me while I put all my feathers back.